WASHINGTON — A longtime Northern Virginia lawmaker is sharing her own experience of abuse, as the House of Delegates moved Thursday to require sexual harassment training for members of the General Assembly and their full-time staff. In an interview Thursday, Del. Vivian Watts of Annandale said she dropped out of the 11th District congressional race in the early 1990s because she realized she had to deal with childhood sexual abuse not just for herself, but to help other family members. Watts alluded to her experiences earlier in the day on the House floor, as she pushed for the inclusion of more specific details in the legislation about what must be a part of the sexual harassment training. The bill that passed 88-10 leaves the specifics to the clerks of the House and Senate. “I, for years, have rarely, rarely, rarely ever mentioned what I’m about to mention, because I only wanted to say it when I thought it was relevant, and it made a difference,” Watts said. 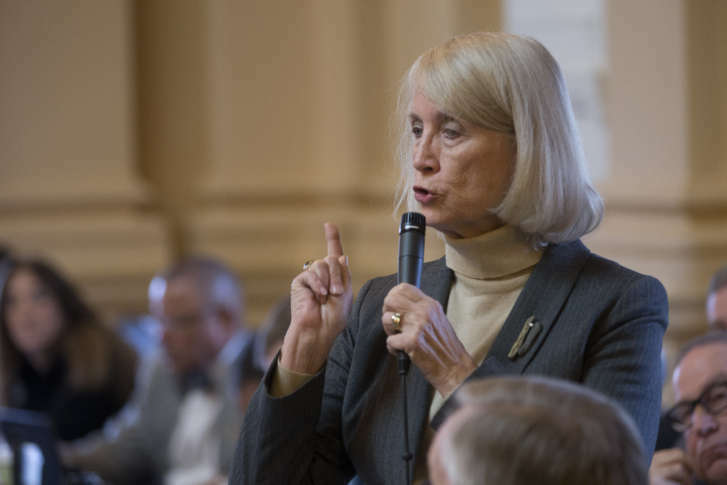 When she returned to the General Assembly — after her time as Virginia’s secretary of transportation and public safety — she worried that discussing her experiences in detail could damage her standing. “There were years and years of therapy that went into the situation where someone in trust instead used that trust as a predator. And when that trust is broken, the individual often feels guilty — ‘Did I deserve this? It’s not happening to anybody else’ — because we keep it secret, because we don’t have processes that allow an open reporting system,” she said. In 2002, House Speaker Vance Wilkins, who had led Republicans to control of the House of Delegates, resigned after news emerged of his $100,000 settlement with a younger woman, who had accused him of groping her, among other inappropriate actions. She had worked at his construction company. The report was followed by a number of accusations of inappropriate touching or harassment from other women. “We have a position of power as elected officials that sometimes members may or may not appreciate,” Watts said. An experience of abuse, harassment or assault can shape a person’s decisions about career path and personal life, Watts said, which raises the importance of the specific training and policies on sexual harassment. “And that’s not business as usual,” she said. In the General Assembly, Watts said, harassment issues tied to lawmakers or staff can be reported to the clerk’s office. “Technically, yes, you could go talk to the clerk and the clerk would deal with it if you did, but the awareness and the feeling that I could talk to the clerk is absolutely not something that is recognized,” she told WTOP. Watts hopes anyone with a concern knows there is a clear way to raise it and get it addressed, but she is also concerned about the actions of others in Richmond, like lobbyists, who would fall outside the policy. “Any woman, any girl, who comes down to the General Assembly for whatever reason … I want to make sure that their experience here doesn’t in any way taint their desire to move further into public service,” Watts said.